Ivan Dikic, Professor of Biochemistry and Director of the Institute of Biochemistry II, Goethe University Medical School, Frankfurt, has spent his career understanding the mechanisms of ubiquitin signaling. Ubiquitin is the most versatile form of post-translational modification known to date controlling a large array of diverse cellular processes. 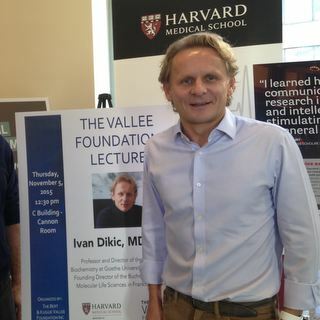 One of the leading centers in the field is at Harvard Medical School where Dr Dikic recently concluded his Vallee Visiting Professorship. In particular, he said, he was attracted to the modern multidisciplinary experimental approaches - including proteomics, bioinformatics, large-scale screens and microsocopy methods - that are developed in Boston. On November 5, 2015, Dr Dikic gave a Vallee Lecture at Harvard Medical School where he presented his data on ubiquitin and autophagy networks and explained how these pathways regulate normal cellular processes and how they are involved in the pathogenesis of several human diseases. The auditorium was packed and the lively discussion which followed was a rich and rewarding conclusion to Dr Dikic’s Vallee Visiting Professor sabbatical.